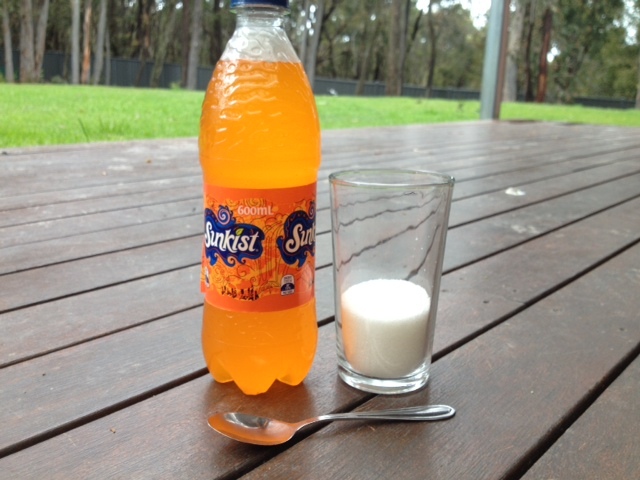 There are 17 and a half teaspoons of sugar in a 600ml bottle of sunkist. This is what it looks like. We wouldn’t put that in tea or coffee. This drink contains 1330kj, a 6 inch subway sub contains around 1000kj. If you are wanting to make a change to your nutrition for the better DRINK WATER it has zero kj!! Wow! I knew these drinks were sugary but not as bad as this. Still leaves me astonished to see a bottle or more of this in ‘families’ shopping trollies. Drinking this is almost self abuse I recon. Kids wanted to drink the soft drink at our ‘footy tipping’ lunch yesterday…I let them have a mouthful each only! I had soda water! Blog looks great Jac. Can’t wait to see more posts.. You’ll be snapping us at bootcamp tonight!